I begin this month with a question: How well do you know your PM program? In this column, I will teach you how to be successful without truly being successful. It is quite easy, actually. First, what is PM? PM is Pretend Maintenance. Pretend Maintenance is an approach wherein you go about managing your assets as if you have a good strategy but you do not. Pro tip: Fake it until you make it! Continue pencil-whipping PMs. This is key to successful compliance. It will help your PM and schedule-compliance numbers. With good numbers, you can brag about how well you are doing. Continue your awesome lubrication practices. Here are a few ideas to keep them awesome: Remember, more is better, so if you do lubricate, make it worthwhile. If you do not feel like lubricating all of those grease fittings, the best thing to do is to take a tube of grease with you on your route. Dip a finger in the tube, as to get a huge blob on the tip of your finger. This is to maximize speed and efficiency as you complete this task. Go from grease zerk to grease zerk, dabbing that lubed finger onto each zerk, giving the appearance of a lubed bearing. The best thing to do is to just not grease at all. Elimination of this task will increase your break time. Blame the operators for terrible asset performance. Forget the fact that we hired a button-pusher with no intent on training them to be successful. They never run the machines correctly anyway, right? This is the quickest way to defend yourself and your department in meetings. Ask for money for a maintenance solution. Pick a very high number without providing justification for it, knowing full well the request will be denied. At least then you can blame management for your inability to run your maintenance department. Blame your mechanics’ incompetency when you have extended downtime. Blame HR for hiring warm bodies– it seems like if someone can fog a spoon, they are hired. Celebrate the mechanic who finally figures out the extended downtime issue that should have never occurred in the first place. Celebrating failure should be the mantra of the organization. Have a cookout or an ice-cream social to celebrate his success. When something breaks and you do not have the part, make sure you order more than needed. For example, if you have a gearbox fail, and let’s say that gearboxes fail every five years, make sure that you order about 12 of them so that it doesn’t happen again. Why not have 60 years’ worth of gearboxes in inventory? 1 + 1 may equal 2, but order 3 just to be safe. Have a reliability engineer position because it is cool. Everyone else has one; why shouldn’t you? Have a maintenance planner who does no planning. This individual should spend time finding parts for mechanics, answering questions, and maybe even answering calls on the floor. As long as you have one planner, you can tell everyone you are planning work. Buy a bunch of predictive maintenance tools and technologies, but let them collect dust. They make great bookends and you can tell everyone that you have PdM tech on hand. If you implement these 10 pro tips, you will definitely set yourself apart as next-level material. You can fake your world-class status by selling everyone on all the great things that you have on hand. The company will soon promote you to a level of incompetence, with the hope that you can do the same for the organization! Good luck on your journey! Like this blog? 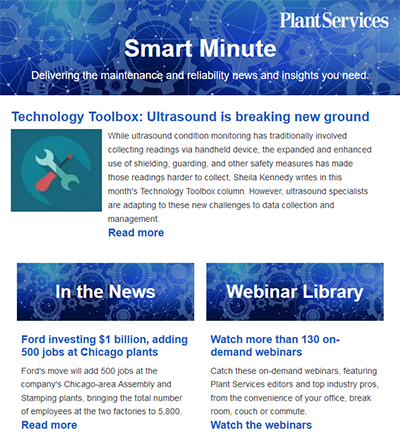 Sign up for the daily Plant Services Smart Minute newsletter and get articles like this delivered right to your inbox.